El Grupo Género y Economía (Gender and Economy Group, or GGE) is a collective composed of women and social organizations that are committed to developing the social and solidarity economy using the lenses of gender equity and social justice. 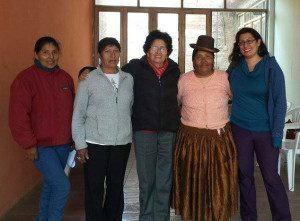 Founded in 1992, they serve as capacity builders, facilitators, and alliance builders of women’s movements across Peru, ensuring local contributions are part of decision-making at the national level such as participatory budgeting processes. 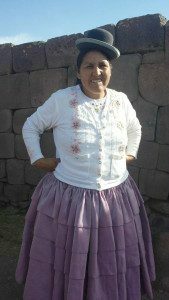 GGE is also a member of the World March of Women, and as such, navigates between global spaces and local spaces in Peru. I visited them last October and here’s what I learned from GGE about how to be an effective ally and accompanier to indigenous women. 1) Build relationships, listen, and respond. 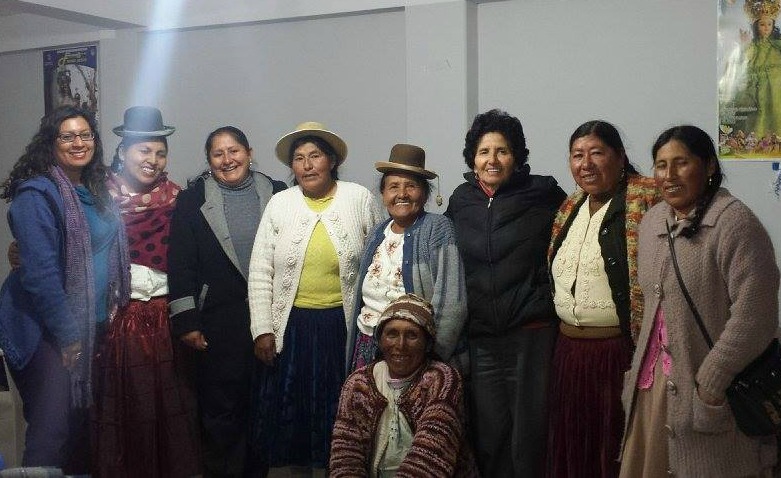 In the land of quinoa producers in southeastern Peru, Aymaras and Quechuan women in Puno are building a state-level women’s organization called ADEMUC (Association of Women Peasant Farmers of Puno). GGE has supported ADEMUC with workshops on food sovereignty and solidarity economy and offered support for ADEMUC’s general assembly every two years. Katherine (left) with members of GGE and ADEMUC. After ADEMUC’s Congress, GGE realized the need for targeted support for the grassroots bases in each of the 12 provinces in Puno to strengthen indigenous women’s leadership on these identified issues. 2) Watch what happens when you invest in political education. We are rural women. Sometimes people say ‘I don’t have time [to go to ADEMUC [meetings], I need to take care of my farm.’ But, do we have hectares? This is not the case, we have little land. It is necessary to make time to listen, modify ideas, learn about our rights…We need to be involved in political advocacy, otherwise anyone can deceive us. From 2011 to 2016, the only indigenous member of Congress was Claudia Coari from Puno. Coari was the Secretary of Women for the Confederation of Peasant Farmers in Peru (CPP) and a member of the La Via Campesina when she was asked to run for Congress. During her tenure, Coari advocated for a national law on food sovereignty. As a member of CCP and as a woman indigenous farmer, she knew the value of putting this law into place. It came directly from her own experience. However, her advocacy of this law was met with several key opponents. In the end, Congress passed a law for food and nutritional security that excluded many important elements of food sovereignty. Despite this, Coari’s legacy has made a significant impact in Puno. She was recognized as being the most active Congress member, proposing over 550 legislative initiatives. Although only 9 of these initiatives were successfully passed, Puno’s indigenous women (both Aymara and Quechua) can now say that one of their own was elected into Congress and is making a difference. For the past ten years, the Gender and Economy Group (GGE) has been working closely with ADEMUC. “The organization goes through their moments of high activism and moments when they work in isolated ways,” says Rosa Guillen, a co-founder and current director of GGE. In addition to ADEMUC, GGE are supportive advisors to several social movements in Peru, including the ANPE (National Association of Ecological Producers of Peru) and CNA (National Agrarian Confederation). GGE is not one to stop the relationship with ADEMUC or any other women’s group, especially since they have witnessed the potential of women’s leadership in the long run.